The site is deserted, even at midday. The Re.5/- entrance fee ($2/- or Rs.100/- for non SAARC foreigners!) is almost an apology, even without the elevated status of a royal tomb. This “last flicker in the lamp of Mughal architecture” is the final resting place of the erstwhile Nawab of Avadh, Mirza Muqim Abul Mansur Khan, also known as Safdarjung, whose exceptional service to emperor Ahmad Shah elevated him to Grand Vizier (Prime Minister) in 1748, and whose excessive ambition cost him that privilege in 1753. 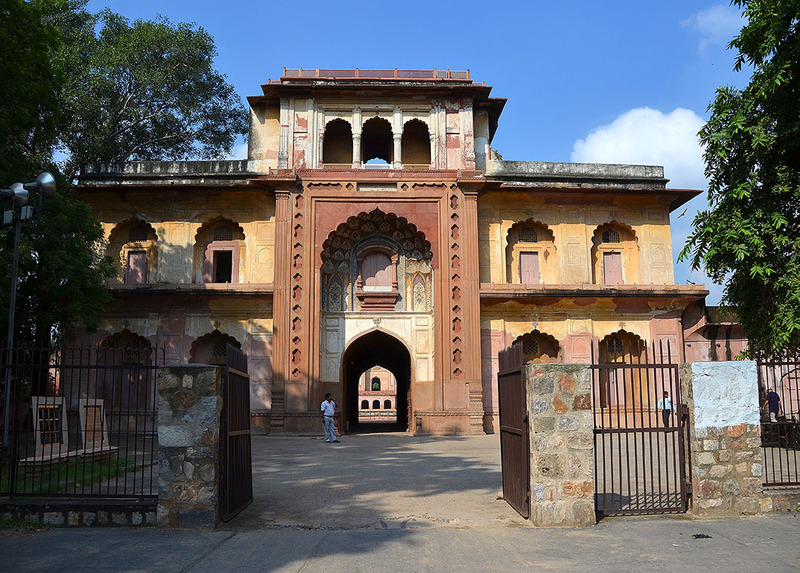 He was banished to Avadh and only returned to Delhi posthumously – a year later – thanks to his son who wangled permission from the Mughal court to interr him at this spot. 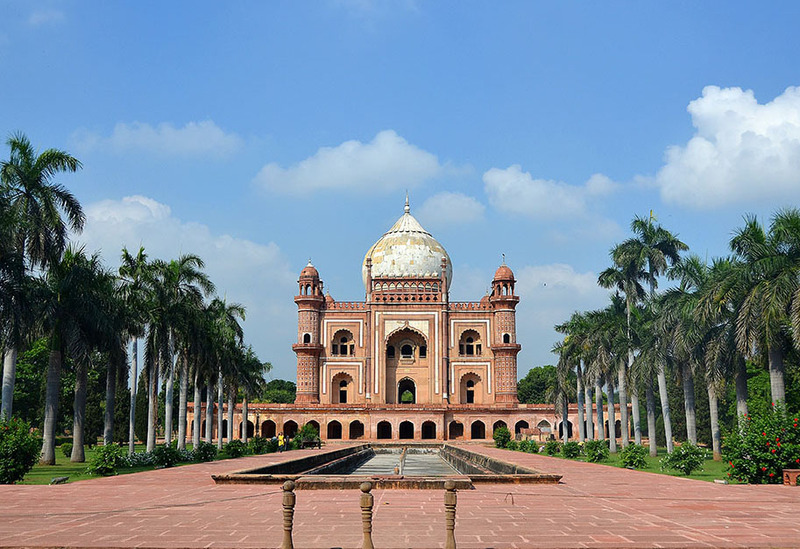 The prominent and ornamental gate frames the monument, that at first glance holds a strong resemblance to its star cousin: the mausoleum of emperor Humayun. It is similar in colour and follows the charbagh (quadrilateral walled garden) style of construction divided by water channels. As you walk in however, you notice the marked absence of refinement. The skewed proportions, the elongated facade, the bulbous dome and its mismatched stone cladding mark a disappointing epilogue to the grand legacy of Mughal architecture in India. In many ways it is said to be a reflection of its times. Of the degenerate lifestyles of lesser emperors and the decline of a great empire. whose famed coffers had been cleaned out by a daring Persian raid. 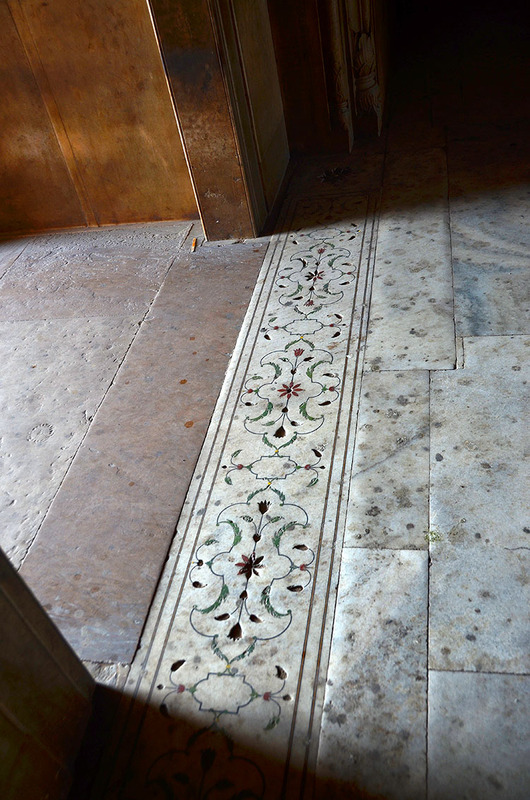 The Abyssinian architect possibly meant it to be as pristine as its iconic predecessor in Agra. But he had no access to the quarries – by then under the control of Jat chieftans – nor the funds. So he was forced to make do with scavenged material from nearby tombs. And resort to almost Moorish arabesque plaster work to adorn the interiors in place of traditional pietra dura..
That, to my mind, is as exaggerated as the ornamentation. 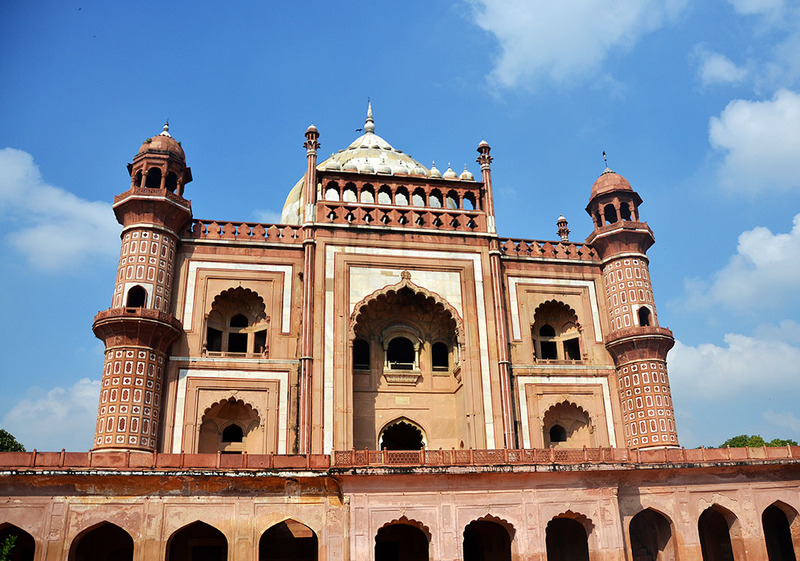 Safdarjung’s tomb isn’t perfect. But viewed singularly and without bias, it is quite beautiful. And nothing justifies its neglect* or that Rs.5/- entrance fee. The beautifully decorated gate. The ASI maintains a library in the rooms above. Unfinished inlay on the thresholds. *The discovery of a buried drainage system has spurred the ASI (Archaeological Survey of India) to restart the fountains. That’s a beginning! It looks a totally fascinating place, Mahdu. That first shot is so dramatic. I think Dalrymple got a little carried away with his old courtesan conceit. Not really appropriate in all sorts of ways. My thoughts exactly Tish. I am no expert on the history of Delhi, but I thought quite a few of Dalrymple’s deductions in the book were over the top. Yes, the monument is fascinating and deserves a little more care and attention. Nice work, Madhu. I didn’t see this one, but I went to Humayun’s Tomb instead, which I think is the other side of the Lodhi Gardens (not sure exactly). 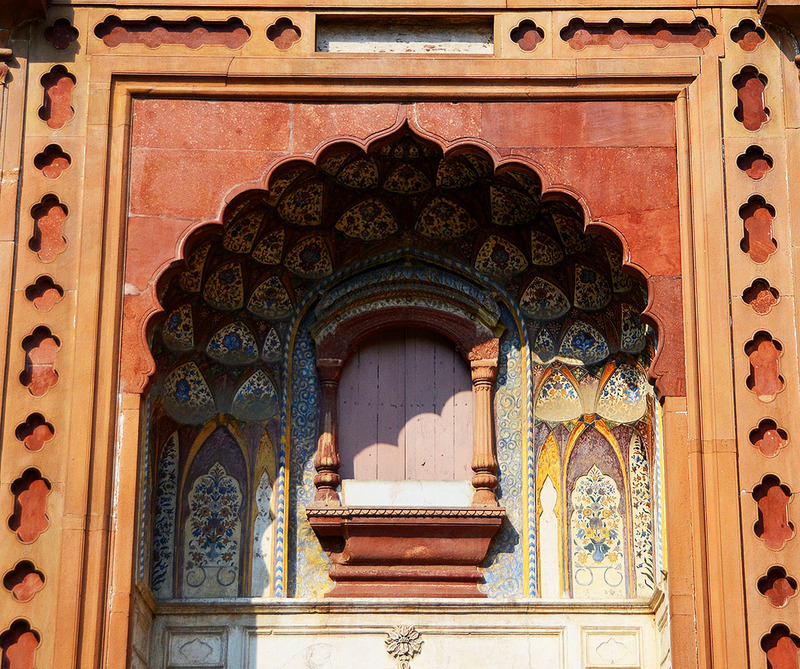 They look very similar from the outside, but great to get a glimpse of Mughal mausoleum architecture! Thanks Lee. Humayun’s tomb is towards the opposite end of Lodi road, and certainly the unmissable monument of the two. Did you go after the 2013 re-opening? 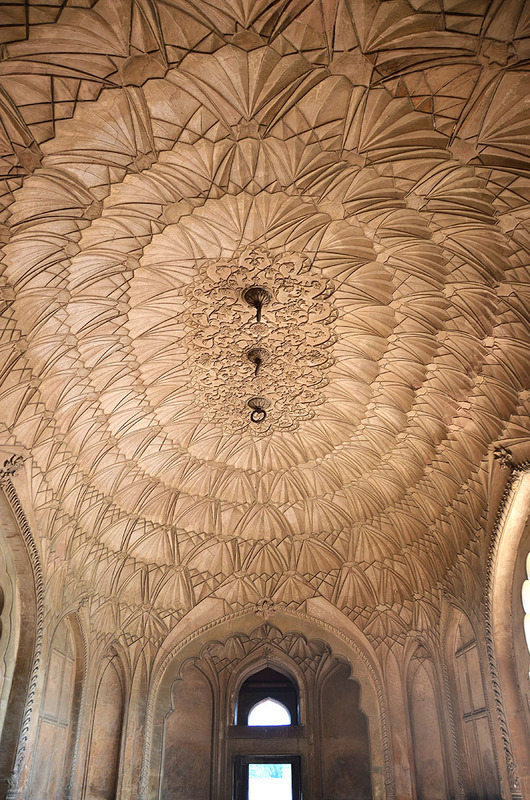 The Aga Khan trust has done a remarkable job of the restoration. Superb pictures. So much more to see apart from the Taj. Oh yes!. But the Taj is the Taj 🙂 Thank you for your visit and comment Wilbur. 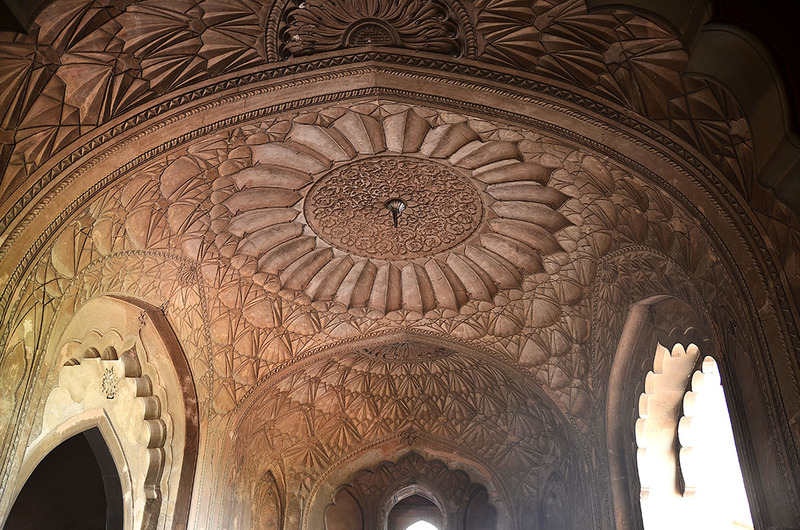 It is so impressive the beauty of the past and the amount of talent/devotion that went into these incredible structures…even though tombs are always a bit strange to me 🙂 Beautiful work Madhu (both writing and photography)! So true, and the amount of wealth for something that at least in my eyes is a bit irrelevant (status after death to me is a bit frightening in terms of understand self and ego)…and yes, Egypt is a whole other story! Thank you for reading Max. Much appreciated. 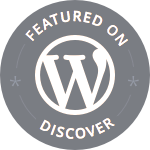 Such an interesting place to visit – and I would be prepared to pay more for the entrance fee. The people who do make the effort to visit can certainly afford more Colline. You’ve captured a quiet beauty here, Madhu. Dalrymple, it seems, got it wrong. Lovely shots and interesting history. Surprisingly, a archiecture beautiful !! the ceiling is extraordinary! thank you for this visit and sharing! Thank you for reading Pat. It looks beautiful. Those ceilings especially are exquisite. Thanks Drake. Delhi is full of fascinating lesser known momuments. Oh dear, I have to imagine it’s the thought that counts but the humiliation of resting forever in a substandard tomb does let the side down . . . Considering it’s not nearly as large or grand as the Taj Mahal, it’s still exquisitely done, all that detailed work inside. The arch of the gates look like peacock feathers, almost. The do indeed. I felt too that the comparision to the Taj was rather unfair. Wow. Loved it in totality. Lets forget Dalrymple and enjoy the heritage of delhi the way it should be appreciated. Have an urge to visit this place. Thanks for sharing and giving me a subject for my Delhi Diary. Thanks Himanshu. It is well worth a visit. Beautiful shots, Madhu. And I enjoyed the bit of history and more importantly the details about the architecture. I Can see the moorish elements, similar to some of the work in the alcazar in Seville and Alhambra in Granada. it is an absolute pity that we don’t value our own historical heritage 😦 they really need to update the pricing… Which I think they have kept as is to make it accessible to all sections of society. Thanks Kan. The question is how many people visit these ‘lesser’ monuments who cannot afford to pay more? They could always have free or discounted admission for school children. I love the commentaries you give on these important historical sites. I suppose we could go to my good friend Wikipedia but somehow don’t do that so to see the pics and the commentary is always helpful. I felt bad when visiting some of those sites to see gems missing from where they were originally implanted in marble walls or floors. That kind of vandalism is unforgivable! I’m not sure if you’ve done one on the Mysore palace. I enjoyed my visits there. No I have not done a post on the Mysore Palace Ian. We visited many years ago and my photos are long lost 🙂 We have friends living there and do visit them, but I haven’t bothered to brave the crowds at the palace since. Shall make the effort on my next visit. That is really beautiful. This gives me something else I’ll need to visit next time I’m in India. Can’t imagine why Delhi isn’t given due importance as a tourist destination Jeff. Perhaps it is relative to the biggies such as the Taj Mahal and the Rajasthan sights. But the city really is a treasure trove of historic monuments. that ceiling is stunning. Dalrymple is in this case as overbown as his description – you’re right. It is a lovely place in its own right. And thank you for the gorgeous photos! Thank you for stopping by to read and comment Keira. when I have finished these latest drawings, I shall be stopping by to comment more! 🙂 Look forward to seeing you! The world’s greatest monuments seem to always be one of the three: church/mosque/temple, palace, and tomb. As for the latter, India certainly has a fair share of impressive tombs, including the one of Safdarjung, regardless what Dalrymple said. It’s good to know that the ASI is starting to pay attention to this forgotten heritage. 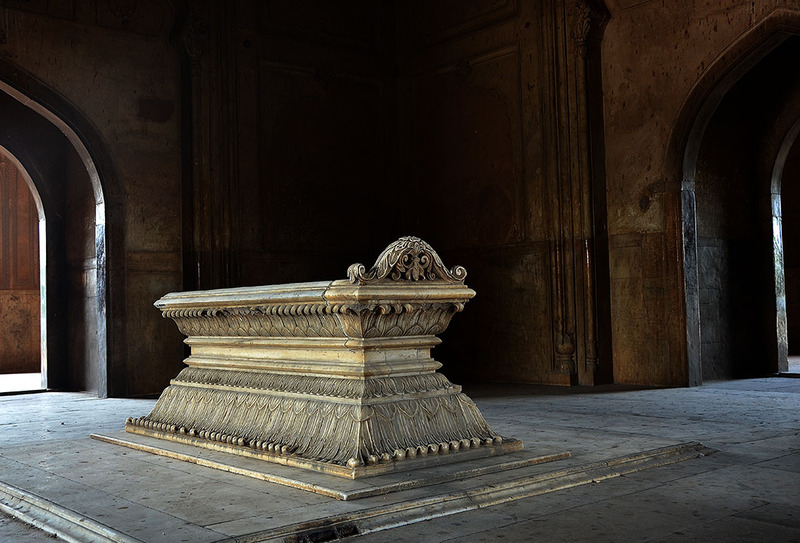 Delhi alone is littered with tombs Bama. Would love to spend another week there sifting through the layers of history. It’s a great pleasure to visit such a beautiful structure and see it through your eyes. Thanks for the pictures and the explanations. You are most welcome Shimon. Glad to know you enjoyed it. I !thought it was Humayun’s at first glance. It is beautiful in its way, not everywhere can have the same glamour can it? The plasterwork is amazing and the whole place just needs a little love, I hope it gets the care it deserves. I hope it gets the attention it deserves too Gilly. The history is what makes these sights fascinating for me as well Pauline. And there is no dearth of it in a place like Delhi. Wonderful architecture Madhu, really enjoyed your write-up of the place. Thank Mary. Glad you enjoyed it. Looks beautiful with all it’s flaws! Beautiful architecture and work, yet what struck me was that nobody was there … actually sad. Thanks for the journey, explanation, and beautiful images. Most welcome Frank. It was disappointing to see the place deserted. Lovely write up, Madhu. The mausoleum has wonderful artwork. It sure does Niranjan. Thank you for reading. I saw only beauty Madhu. The plasterwork is amazing. Beauty is sometimes even more pronounced because of the imperfections. Sad that some people don’t see or understand that fact. At first glance it looks very magnificent, and it makes me curious about the circumstances and the people who built this. I think a flaw or two, whether we are talking about a person’s character or architecture, makes an even better story! Thanks so much for sharing it, as you always do, with great style and beauty. Thank you Naomi. Have a fabulous day! Ornate, yet still lovely. It would be great if the dead could be honored thru living memorials to allow these structures to be inhabited by those who struggle in this exotic location. It is strange how such a beautiful structure can be devoid of visitors – the pictures really convey a mood of neglect. Dalrymple’s Victorian prudishness is just snide and off-putting… yes it was unfinished and not quite Humayun’s Tomb, but I think there is something very charming about the building’s imperfections. Given those tumultuous times, you can’t fault the resourcefulness of the architect and craftsmen who worked on the tomb. great post again. these tombs seem to hold so much of the “unknown” in them. have you ever gotten random chills while near them?